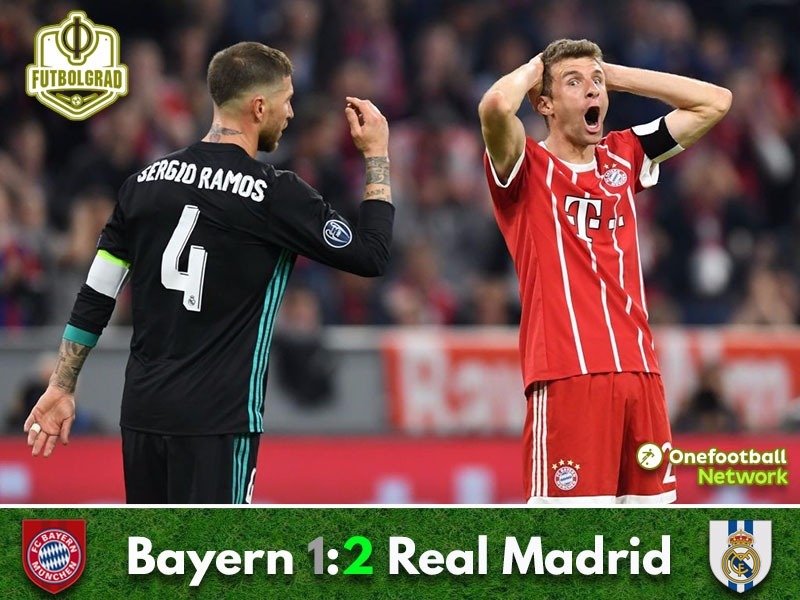 Bayern v Real Madrid was the expected match on the very highest level with Los Blancos benefiting from the individual mistakes committed by the Bavarians. Bayern came racing out of the blocks with Robert Lewandowski breaking through straight from the kickoff but his pass to Thomas Müller was not accurate enough, and Real Madrid was left off the hook. It could have been a great start for Bayern, but just within minutes, Bayern had missed a major chance and then lost Arjen Robben to an injury in the fifth minute. The two teams nullified each for much of the early goings of the first interval until Real Madrid slowly but surely took control. Bayern, in fact, struggled to get out of their half. But then Joshua Kimmich managed a breakaway from his half in the 28th minute, stormed into Real’s box and spotted that Keylor Navas was off in his positioning and the right-back finished the counter with a beautiful goal. Bayern were up front but were forced to make another change with Jérôme Boateng going down with an injury in the 33rd minute. But Bayern were unaffected at first, and Ribéry should have doubled the lead in the 34th minute when he went one-on-one with Navas and Mats Hummels in the 40th after a corner kick. Right in the phase were Bayern were dominant Real scored the equaliser with Marcelo hitting a perfect volley from outside the box in the 45th minute. Bayern tried to hit back right away with Lewandowski placing a header in the arms of Navas after a freekick by James Rodríguez. It was a fantastic first 45 minutes in which both games nullified each other. The second half started just like the first half ended. In the 50th minute, Ribéry dribbled his way through to the byline and played the ball dangerously in front of the goal where Sergio Ramos and Raphael Varane collectively stopped Müller. Bayern were better, but Real Madrid scored the second goal. Rafinha lost the ball in midfield to Lucas Vazquez, the forward broke away with Marco Asensio, and Vazquez spotted his teammate, who easily put the ball away in the 57th minute. Bayern were unfazed by the goal. Ribéry in the 58th and 62nd minute tested Navas with two close-range shots. In the 68th the goal shout was on the tongues of everyone in the stadium. After a cross by Kimmich Javi Martínez extended the ball with his head but Müller and Lewandowski stumbled over each other to prevent Bayern’s tying goal. On balance, the Bavarians would have deserved the equaliser but did not find a way through a well organised defensive line. In the 88th minute, Lewandowski was through after a great pass by Thiago, but the Polish forward missed the goal altogether. The time was running out for the Rekordmeister, who despite visible dominance failed to manage a breakthrough in the final third. Lucas Vazquez was the Futbolgrad Network man of the match the winger jumped on Rafinha’s mistake to set up Real Madrid’s winger. Zinedine Zidane then delegated the attacking winger to the backline where Vazquez was charged with taking Ribéry out of the match, and the Spaniard did exactly that helping Real to wrap up a crucial victory in Munich. Bayern wanted an opponent, and they got one. Although dominant for vast stretches of the match Bayern lost the game mostly due to individual mistakes. Perhaps the two injuries in the first half in which both Robben and Boateng went off with injuries was the difference that evening as Bayern head coach Jupp Heynckes was deprived of alternatives. Bayern had 60% possession, 17 shots, 5 shots on target and 14 shots inside the box but only managed the one goal. Joshua Kimmich has scored the 100th Champions League goal in Jupp Heynckes’ managerial career. Thomas Müller made his 13th semifinal appearance – more than any other German players.